A reconnaissance study distinguishes coastal areas of the northeastern U.S. (approx. Virginia to Maine) that will experience an inundation-dominated response to sea-level rise from those that will respond dynamically due to physical and bio-physical sedimentation and erosion processes. Areas that will be dominated by inundation include urban regions of intense development and/or coastal engineering, as well as bedrock coasts. Areas that will respond dynamically include beaches, unconsolidated cliffs, barrier islands, and wetlands. Distinguishing which processes are relevant to sea-level rise impacts in these areas aids prioritization of scientific research and decision support efforts. Preliminary results indicate that the region's coastlines show large sensitivity to sea level rise and vary in their ability to respond dynamically to that sea level rise. This project will organize and prioritize research and decision support needs of the coastal zone. Specifically, climate predictions are uncertain and there are plausible regional differences in climate responses that should be considered, such as sea level, storminess, and precipitation. This framework will help to integrate this knowledge into the corresponding local morphological and ecological impacts. 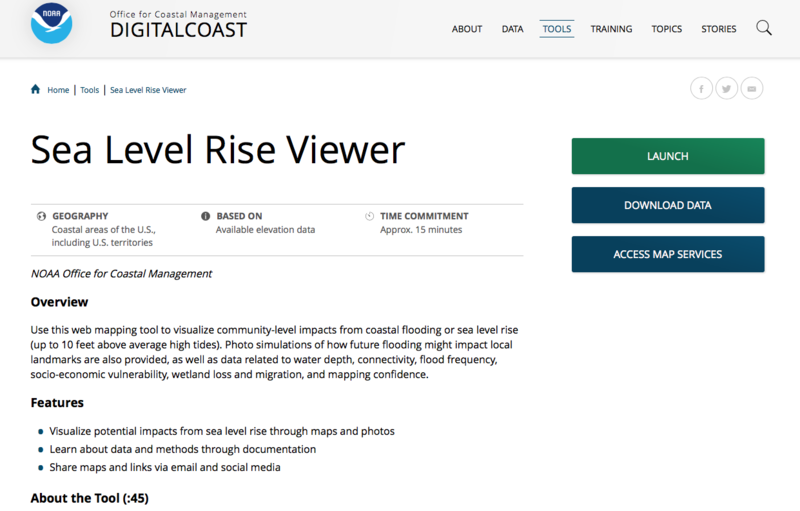 Also see Dr. Robert Thieler's A Research and Decision Support Framework to Evaluate Sea-level Rise Impacts in the Northeastern U.S.
A web mapping tool to visualize community-level impacts from coastal flooding or sea level rise (up to 10 feet above average high tides). Photo simulations of how future flooding might impact local landmarks are also provided, as well as data related to water depth, connectivity, flood frequency, socio-economic vulnerability, wetland loss and migration, and mapping confidence. 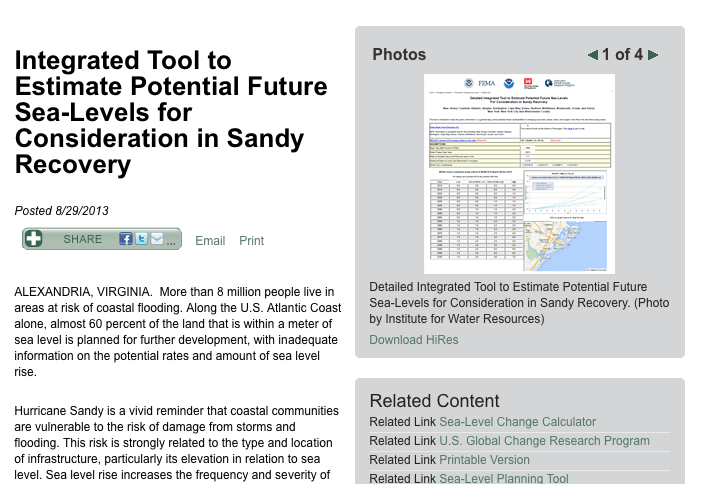 A web tool to assist in developing information to support its sea-level change policy, which supports the USACE overarching climate change adaptation policy. Hall, J. A., Weaver, C. P., Obeysekera, J., Crowell, M., Horton, R. M., Kopp, R. E., ... & Veatch, W. C. (2019). Rising sea levels: Helping decision-makers confront the inevitable. Coastal Management, 1-24. Garner, A. J., Weiss, J. L., Parris, A., Kopp, R. E., Horton, R. M., Overpeck, J. T., & Horton, B. P. (2018). Evolution of 21st century sea level rise projections. Earth's Future, 6(11), 1603-1615. Lentz, E. E., Thieler, E. R., Plant, N. G., Stippa, S. R., Horton, R. M., & Gesch, D. B. (2016). Evaluation of dynamic coastal response to sea-level rise modifies inundation likelihood. Nature Climate Change. Horton, R., Little, C., Gornitz, V., Bader, D., & Oppenheimer, M. (2015). New York City Panel on Climate Change 2015 Report Chapter 2: Sea Level Rise and Coastal Storms. Annals of the New York Academy of Sciences, 1336(1), 36-44. Lentz, E. E., Stippa, S. R., Thieler, E. R., Plant, N. G., Gesch, D. B., & Horton, R. M. (2015). Evaluating coastal landscape response to sea-level rise in the northeastern United States: approach and methods (No. 2014-1252). US Geological Survey. Little, C. M., Horton, R. M., Kopp, R. E., Oppenheimer, M., Vecchi, G. A., & Villarini, G. (2015). Joint projections of US East Coast sea level and storm surge. Nature Climate Change. Kopp, R. E., Horton, R. M., Little, C. M., Mitrovica, J. X., Oppenheimer, M., Rasmussen, D. J., ... & Tebaldi, C. (2014). Probabilistic 21st and 22nd century sea‐level projections at a global network of tide gauge sites. Earth's Future. R. Thieler, E. Lentz, R. Horton. American Geophysical Union Annual Meeting in San Fransisco, CA, December 15, 2014. R. Thieler, R. Horton. American Geophysical Union Annual Meeting in San Francisco, CA, December 15, 2014. R. Horton. University of Colorado in Boulder on March 5, 2014. R. Horton. UNAVCO conference in Bloomfield, CO, March 4, 2014. R. Horton. Hurricane Sandy Task Force Resilience Incentive Prize Workshop, NY, NY, May 8, 2013. R. Horton. USGS-NPS Strategic Sciences Group Meeting on Hurricane Sandy, NJ, March 2013.